After install 2009 Q1 and download VS extension, I received an error during VS extension installation without any indication except some of program is missing. What should I do to fix this? I also had an install error...mine said "C# was not installed", which is correct. I only work in VB...do I have to install C# to have the Telerik Visual Studio Extensions? Jeffrey, indeed, the check for the installed C# language is our glitch. We will fix that for the first Service pack release. Please, find your Telerik account updated for helping us figure this out. Malik, can you please tell us the exact message you got? If it helps finding a bug, we will do our best to have it fixed for the first Service pack. Needless to say, your Telerik account will be updated accordingly. I have been trying for roughly 14 hours now to get 2009 Q1 installed from when I downloaded it earlier today. I am fairly new to the company and a developer who is no longer with the company was evaluating 2008 Q3. I installed that version and put together a few simple pages to see if we might consider start moving off of a expensive and antiquated RAD tool we are currently using for our application which has 800 or so tables and 400+ windows which is used for tracking healthcare claims and information in agencies across the USA. Since we were seriously considering RAD Controls I downloaded 2009 Q1 and have been unsuccessful in getting it to work with Visual Studio 2008, which 2008 Q3 did work under (with a few quirks) I have gone so far as to do about 6 cycles of remove (using AddRemove Programs) of the RAD tools as well as Visual Studio 2008. NOTHING has worked! I keep getting a message that the <Rad Control file> can't be found. To make a very long and frustrating story short, WHY? I'm not using any of the projects I created with 2008 Q3, as a matter of fact I have completely removed every trace of it from my machine. PLEASE help me get past this issue. We are not a very large company, about a dozen developers, and 30 employees overall, but our software has a huge presence in the healthcare industry and it is growing. Don't know what I did but it started working and I put together some "real" pages. While testing one of the pages I clicked on the run arrow in VS and it took quite a while to start the web page and then I got an error message. I went back into VS and now I'm getting the missing file messages again. If we are going to use the Telerik tool suite we NEED to know what is causing these issues. In addition to this the RadWindow object comes and goes in Visual Studio. You can get to the properties of the object but it disappears from the page and will come back, sometimes, after running the page in a browser. The RADChart control has NEVER worked correctly in design. You can resize the object. It sits at 14pix by 16pix no matter what you put in the properties. It runs in the browser but there is no way to see what the chart will look like in VS. All of this a a moot point if we can't get rid of the missing files error. PLEASE HELP! We have answered the support ticket that you have posted with the same info. Please review it and let us know if the suggestions help. We are looking forward to solving your issue as quickly as possible. The error I got was "Telerik RadControls for ASPNET AJAX are not installed". I used the Hot Fix download to copy dlls but apparently, this is not sufficient for Visual Studio Extensions. Do I have to install the full package instead of the Hot Fix? Yes, you would need the full install package. I have performed full install package but I still have this error "Telerik RadControls for ASPNET AJAX are not installed". I don't know what else I can do. It won't install with VS2008. Any suggestion? We have replied in the forum thread you started about this issue. I have Telerik's ASP.NEt AJAX installed successfully on my windows xp + visual studio 2008 with SP1, when i install telerik on my other development machine with same config windows xp + visual studio 2008 with sp1 the components dont load. I get this error "Error rendering control -RadScriptmanager1, An unhandled exception has occured. could not load file or assembly 'Telerik.Web.UI, version=2009.1.402.35, culture=neutral, PublicKeytoken=121fae78165ba3d4 or one of it dependencies." I have followed the instructions on Atanas Korchev posted an article recently, but of no use. I am frustrated as my project is getting delayed, why does it have to be so difficult to install a component? On my home vista machine i have the same install issue which is yet to be resolved, till then i am sitting with this expensive rad tool which i am not able to work with. Try running the page despite the errors in design time. Does it run fine, or are there any runtime exceptions? If there are runtime exceptions, please send the error message to me, I'll try to help with a suggestion. If the page runs fine and the problem is only with the designer, you could try opening the bin folder of the website in Windows Explorer and manually delete both the Telerik.Web.UI.dll and Telerik.Web.Design.dll files. Then navigate to the RadControls installation folder (typically [ProgramFilesFolder]\Telerik\RadControls for ASP.NET AJAX Q1 2009\bin35) and copy these two files again. If that does not help, can you please, pack your project and send it to me so that I check it locally? I assumed and mistakenly saw that my visual studio 2008 had sp1, but it was instead framework 3.5 sp1 which is not same as VS 2008 sp1. 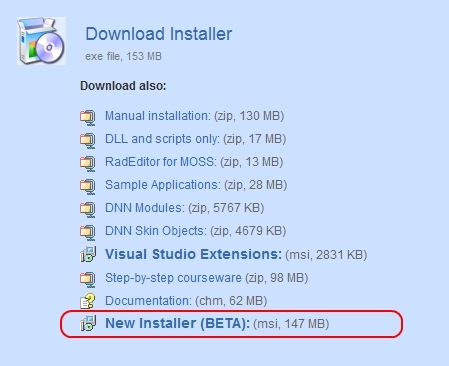 In short, download and update visual studio 2008 sp1 manually. Mehdi, glad to know the problem is solved now. Lina, I'm not sure why the RadControls for ASP.NET AJAX detection of the VSExtensions installer fails on your side. There is a small hack, which allows you to have the VSExtensions without running the official RadControls installation. Please, keep it secret ;-). If you run the Telerik.Web.UI_2009_1_311_VSExtensions.msi from the command line, providing the SKIPRADCONTROLSSEARCH=true argument, you will get the controls installed, i.e. To uninstall the package you should use the same argument, i.e. Please note, this is just a hack for testing purposes. It installs the accompanying files to the <SYSTEMROOT>\INSTALLDIRRADCONTROLS folder. When using that, you also need to browse to the Telerik.Web.UI assembly manually. There is no validation in the Project Configuration Wizard, so missing to navigate to a proper Telerik.Web.UI assembly would result in an error. Please give it a try and let me know if everything is fine now. Please note, you need to run the MSI as an administrator. Finally got it to install VSE. I must completely turn off UAC Control in Vista. If the UAC Control is on then it will fail to recognize if the ASPNET AJAX is installed so there will be no more "Telerik RadControls for ASPNET AJAX are not installed" error. Thank you for your patience Erjan and all your help! Actually we found this a bug on our side and we already fixed it. Please, download the RadControls for ASP.NET AJAX VSExtensions package and run it again if you do not want to turn your User Account Control off.